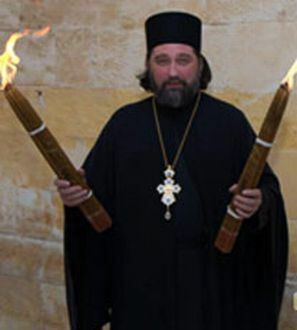 In the following interview, Roman Gultyaev speaks with Archimandrite Isidore (Minaev), Head of the Russian Ecclesiastical Mission in Jerusalem, about the descent of the Holy Fire on Holy Saturday. Fr. Isidore, pilgrims to the Holy Land often ask questions about the miracles that take place here. The most important among them is the miracle of the descent of the Holy Fire. Many pilgrims strive to come here on Pascha specifically in order to be in the Church of the Holy Sepulcher on Great Saturday. 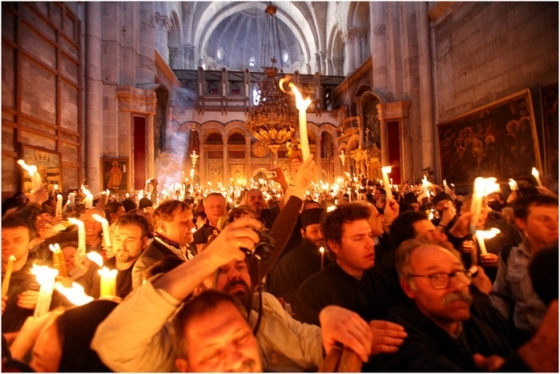 One pilgrim writes: “My daughter and I came for Pascha in order to see the Holy Fire. To our great disappointment, however, we did not manage to be present at the descent of the Fire. We arrived at the Church of the Holy Sepulcher on Holy Friday, took our places, and spent nearly twenty-four hours there. But when morning came, Israeli soldiers forced us not only to leave the church, but even to leave the Old City. Having lost our chance to partake of the grace of the Holy Fire, we returned home empty-handed. Tell us, Fr. Isidore, how can we manage to see the Fire next time?” This is at once a question, a disappointment, and a grievance. I would reply to this as follows: Now, after decades of suppression of the faith in Russia, spiritual life has begun to revive a bit. It has become accessible to all, but many of the faithful do not possess a church culture. It is a given that we should try to venerate holy things, go to church, attend the celebration of feast days, and make pilgrimages. All of this is correct. But those who do not have a church culture mix up many things. For example, they want to come to confession on a patronal feast day, which is inadmissible. On a patronal feast day we need to celebrate a beautiful divine service, partake of the Holy Mysteries of Christ, receive guests, and talk with pilgrims and the press. There is no way we can confess a crowd of parishioners. People simply do not understand this, and this is a clear sign of the absence of spiritual culture. On their son’s wedding day no one would wash their clothes or re-glue their wallpaper. New Christians have no small number of strange, exalted desires and delusions. For example, they think: “It would be good to get married in Jerusalem, and it is better to be baptized in the Jordan.” But this is called spiritual bad taste. One should be married and baptized in one’s own parish church, as it was before the revolution. In those days marriages were done only in the parish of the groom or bride, in which they were registered. It is the same thing for the feasts of Pascha and Nativity. These should be observed in one’s own place – after all, there are people there who are in need of our care: the elderly, children, prisoners, and the ill. This way the feasts are quiet and peaceful. They should not be burdened by journeys, pilgrimages, or difficult household matters. In our home parishes we are better able to pray peacefully, without having to deal with the upsetting surprises that come with travel. It is a contemporary pseudo-ecclesiastical conviction that one must go somewhere on feast days, to join the crowd, to get into the thick of things. Whoever decides to do this should expect to be disappointed. Modern means of transportation have enabled us to travel quickly and freely throughout the world. But we should use discernment, just as the Holy Fathers of the Church advise us. Paschal joy is above all quiet. In the silence of Holy Saturday we remember Christ lying in the tomb. On this day we sing: “Let all mortal flesh fall silent, and stand with fear and trembling; be mindful in himself of nothing on this earth.” This should be our aim. But to pick up and go somewhere just before Pascha, to another country, where we will have to go through customs, get a hotel, take busses, deal with different climates and time zones, and a crowd of similar needs…? The Church of the Holy Sepulcher is not all that large (many provincial Russian towns have much larger cathedrals), but everyone wants to get inside: Greeks, Arabs, Armenians, Georgians, and pilgrims from all over Russia, Ukraine, Belarus, Moldavia, and America. They all come, but only a certain number of people can get in. Last year, for example, the Russian Ecclesiastical Mission was given about 200 passes, and these had be distributed among the representatives of various dioceses who had come for the Holy Fires, co-workers of the mission, diplomatic workers, benefactors, hierarchs, priests, those responsible for ecclesiastical matters, and representatives of the press. Of course there were no more passes left for our simple pilgrims. I do not consider it necessary to travel to the ends of the earth for special grace on a feast day. One should meet Pascha at home. One can more peacefully venerate the sites in the Holy Land on other days, when there are fewer temptations and causes of stress. Moreover, this is a wonderful way of prolonging the Feast of Christ’s Holy Resurrection. After all, we can sing “Christ is Risen” on any day of the year when standing before the Life-Giving Tomb of the Lord. Fr. Isidore, but the Holy Fire descends only once a year, namely on Orthodox Pascha. Many travel to Jerusalem specifically in order to see this miracle. What could be more attractive to pilgrims than the Holy Fire? This really does attract both the ordinary and the “exalted” pilgrim. Yet, at the same time, our great saints, Sergius of Radonezh and Seraphim of Sarov, did not give any thought to the Holy Fire, serving in their skete or at the monastery, as prescribed by the Church’s Typikon. We must understand that the purpose of the Christian life, as well as the joy of the Christian Church, is above all to be united with God. And this is possible through kind deeds, through the forgiveness of offences, and through sacrifice, whether by something brought to church or given to a poor person. It is possible through good deeds, prayer, and the Church’s Mysteries. As such, we can have a church in any cave, in a secluded forest, in a desert, in a metropolis, or in Antarctica. We can pray anywhere. Why do people feel compelled to take upon themselves such exertions, throwing themselves both physically and spiritually into the thick of things? 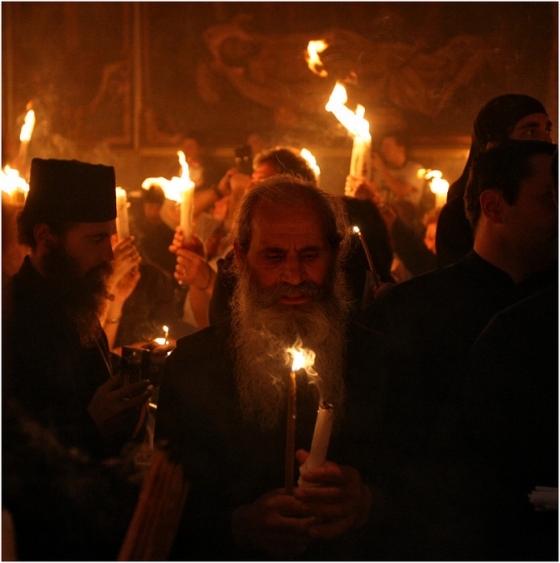 I do not really understand why a Christian must at all costs attend the rite of the descent of the Holy Fire – or, as it is called in the Greek tradition, the rite of the Holy Light. I myself, for example, previously had no such intention; but now I am duty-bound to be there. But I assure you that if it were not for this necessity it would never have entered my head to leave my own parish or monastery on Pascha and travel somewhere in search of special grace. But then, miracles happen all the time in the Church. In the morning the Eucharist is celebrated in church. This is a Mystery. The bread and wine are consecrated by the prayers of the faithful and the sacred action of the priest, becoming the Body and Blood of Christ. And we commune of these Divine Mysteries. What could be loftier than this miracle? What could bring us closer to communion with the Divine than Holy Communion? It is written: He that eateth My flesh, and drinking My blood dwelleth in Me, and I in him (John 6:56). Visiting Jerusalem and the Church of the Holy Sepulcher does not constitute a necessary condition for one’s salvation. For many, this is a kind of spiritual hobby or even an unhealthy curiosity. If we turn to the theologians of antiquity and our own times, we find that they explain that seeking miracles is a matter of complete delusion in the spiritual life. We must seek purity of heart. We must above all seek repentance and true and sincere prayer. We must seek out someone whom we can help from those around us, someone who is not as well off as we are. But seeking miracles is like playing tricks. All of the Holy Fathers and ascetics advised us to flee from miracles. Only a spiritually illiterate person can run after miracles. Consider this: When the Mother of God appeared to St. Sergius of Radonezh, he fell face to the earth and would not look at her, thinking that this was demonic delusion, a demonic temptation. He considered himself the greatest of sinners, unworthy of a vision of the All-Pure One. All the saints fled from miracles, because if one lacks true humility, one can be harmed by them and perish. A certain anchorite living somewhere in the mountains once saw a path to heaven, woven from the light of the moon or sun. He thought to himself: “Who am I, a saint? I should see a path to hell, not to paradise.” But the ascetic, not having sufficient humility, embarked on this false path, fell from the rocks, and was killed. The lives of the Holy Fathers are full of such stories. So, given our pride, the seeking out of miracles is a false note; or, rather, it is spiritual immaturity or vain curiosity leading one down a false path. You know that on Holy Saturday there are broadcasts from the Holy Sepulcher that everyone watches. There is a great deal of excitement around this event. In 2009 it became clear that the miracle of the Holy Fire could inspire a lively discussion in our society. There was a mass of sensational and apologetic articles on the subject of the Holy Fire. The essential question was always this: Is this fire a true miracle or is a natural, man-made phenomenon? What do you think, is it right to pose this question? Here in the Holy Land there are many varying accounts and traditions. Some say that it is a supernatural miracle that occurs according to our usual church calendar, and that the very fact of the descent of the Fire confirms the truth of Orthodoxy. (While I had thought all along that it was the presence of love that confirms the truth of Christ’s disciples: By this shall all men know that ye are My disciples, if ye have love one to another [John 13:35]). Others say there is nothing special about the Holy Fire, that it is a liturgical rite wherein special prayers are read and a flame is lit. One can find a description of the service on the website of the Jerusalem Patriarchate. It goes into detail about the composition of the evening service of Holy Saturday. At one point it was performed immediately before the Paschal Matins. Now it is done at 2 p.m. on Holy Saturday, since it had become difficult to perform it on the Paschal night, due to all the people who come, crowding around, shouting, and pushing, which prevents the reverent celebration of the Paschal service. Besides, people naturally become tired after waiting in church for so long, and there is still another long, festive nocturnal service to come. My opinion is neutral. I am not at all interested in questions about such miracles. However, there is another kind of miracle that does interest and fascinate me. Look at Russia, for example. It was an atheistic country. We do not understand how it happened, but people started restoring churches and monasteries, praying to God, having their children baptized, attending Sunday services, and reading and publishing church literature. For me this is a real miracle. Once again, the great miracle is the Eucharist, which is celebrated every day in our churches, and which unites us with Christ Himself. Or when someone has been abused, slandered, and cursed, but does not take revenge, instead forgiving those who had insulted him – to me this is also a great miracle. But for some reason we do not notice this kind of miracle. So I cannot give a definitive answer. This is a question for the Patriarch of Jerusalem. It is he who enters the Kuvouklion. But again, it is an inappropriate question. To me this Fire is sacred in any case. I have been to the service twice, and I saw how the Patriarch, standing before the Kuvouklion, takes off his sakkos and omophorion. They search him altogether symbolically and then he goes inside. Camera flashes are visible, and somebody yells out that these are flashes of the Fire. Someone sees something, someone hallucinates, and then the Patriarch brings out the candles. That is what I have seen. How this Fire appears is all the same to me. I do not ask who lit the candles: God, an angel, or the Patriarch. I have received many eyewitness accounts from pilgrims who say that they have seen fiery lightning in the Holy Sepulcher on ordinary days. This does not elicit any suspicion from me. The Church of the Resurrection is a place where there are always “sparks” on the spiritual plane. Very dear to my heart is a true story about an Arab boy whose candles were lit on their own during the Patriarch’s prayer (the boy was standing on the scaffolding surrounding the Kuvouklion). This boy put out his candles because the Patriarch had not yet brought out the Fire. In his behavior I see the sort of spiritual simplicity and stature, the sort of service to God and the Church, that only great saints possess. And even if in this holy moment, in this the holiest of places, the Fire is kindled by human hands, that does not make it any less holy for me than if it had descended from heaven. I do not want to light my beard on fire to test the miraculous properties of the Fire. To me this Fire is holy. Of course, I relate to this event reverentially. And, of course, I very much dislike hysteria, no matter whose authoritative mouth it may issue from. I would also like to state that we at the Russian Ecclesiastical Mission have begun to study the text of the rite of the Holy Light. The language of this rite states that “Christ is the True Light” and that the “Light of Christ enlightens all.” At the Resurrection of Christ luminescence was visible. Needless to say, the Light of Christ, or the Light of Tabor, is not a proper flame, but namely the Divine Light. But we humans always try to replace the Living God with His image or icon. It is more convenient for us to pray that way, for otherwise we cannot fit Him into our limited consciousness. For us, the Body and Blood of Christ are in the form of bread and wine. Therefore, the Divine Light is also conveyed in the form of Fire, which we can actually see and which we can even kindle ourselves. Moreover, this Fire sanctifies our souls and bodies, which takes place through our human capacity of touch. The Lord has arranged it so that we might receive salvific grace and the illumination of our bodily and spiritual senses through material realia symbolizing the spiritual. That is why we touch this Fire, holding candles in our hands: to receive sanctification through the Fire that is sanctified by the Life-Giving Tomb of the Lord and the prayer of the Church. Fr. Isidore, you have to face the fact that if you tell pilgrims that it is possible that the Patriarch of Jerusalem lights the Fire from an oil lamp this will deeply disappoint them. People consider that if this Fire is from God then it is a true miracle; while if it is lit, even as part of a liturgical act, then it is not from God. I am afraid that if this is all true, people will be so disappointed that they will stop going to church and even stop believing in God. Do they not know that the Patriarch of Jerusalem is from God? Just as every authority is from God, especially in the Church. If these people are fire-worshippers, then they will certainly lose the meaning of their faith – that is for certain. But our Symbol of Faith says clearly: “I believe in Light of Light, True God of True God.” “Light” here means neither fire nor flame, but the Divine Light, the True Light: God. Nor is it written, “fire from fire.” In the given case, Light is simply conveyed to us in the form of fire. I think that people will not stop going to church. We simply need to enlighten the people. People listen to a priest’s words. When a priest blesses water by submerging the cross into it, do they not then consider the water to be holy, that is, to have been sanctified by Divine grace? We also have a similar tradition in Russia. At the Matins of Holy Friday the Twelve Passion Gospels of our Lord Jesus Christ are read. Parishioners purchase the thickest candles they can so that they will burn for the entire service – about three or four hours – until the Gospels have been read. The priest has the people light their candles from his, and after the service they carefully carry the flame home. With these new flames they light all the oil lamps in their homes, which usually have been extinguished before the service. They have known about the Holy Fire in Russia for a long time, and when they could not travel to get it, they took home the fire from the Twelve Gospels. For me this is also a holy thing, inasmuch as any material form is holy in relation to the Divine, to the Spirit. This is a reflection of the Glory of God, of the Grace of God. This is a pious custom. Therefore, I think that people should understand that the most important thing in the Christian Church is love, not fire. And how many crimes against love are committed in the Church of the Holy Sepulcher when they are serving the rite of the Holy Light! People lie to deceive the guards and to get into the church by any means necessary. They yell, push, and abuse one another. They even fight, grumble, get disappointed, lose their prayer, and lose the peace of their souls. Is this what the Lord wants from us on the great day of rest? Of course, pagan motifs and various forms of fortunetelling find their way into the Church: “When the Oak of Mamre dries up, or when the Fire does not descend onto the Tomb, it will be the end of the world.” But in Holy Scripture it is said that no one knows of that hour, not even the angels. And I do not even see what is so bad about the end of the world. The Book of Apocalypse even ends with the words: Even so, come, Lord Jesus (Revelation 22:20), which simply means: “Come, we are waiting for You!” And this is said specifically of the Second Coming of the Savior. Sectarians scare people; they guess and predict. But Christians should be of sober mind, remembering that the essence of our faith is love for God and people, not fortunetelling. Fr. Isidore, many pilgrims come for the Holy Fire repeatedly, such as the Foundation of St. Andrew the First-Called, and bring the Fire back to Russia. Many people who are in church at the descent of the Holy Fire are filled with an inexplicable feeling of spiritual joy. 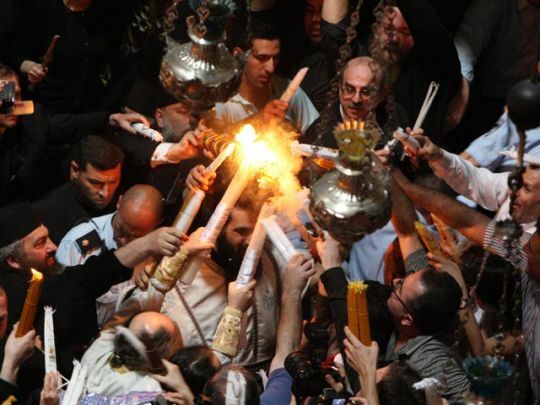 I quote: “They came out of the church as if born again, spiritually cleansed and renewed.” If the rite of the descent of the Holy Fire evokes such feelings, then may it be worth going to for this sake? The Foundation of St. Andrew the First-Called carefully prepares their visit long before Pascha. Simple pilgrims cannot do this. Moreover, what is all this mysticism about? People come to Jerusalem, see the Patriarch, and receive his blessing. That produces a proper joy. But in these days [around Pascha] this is mixed with great difficulty and long waiting. Practically everyone that goes for the Holy Fire misses the Liturgy of Holy Saturday, which is served in the Mission. Many of them are even in no condition afterwards to attend the midnight Paschal service. For them it is already all over, they simply do not have any more physical strength. Moreover, there is culture shock. As someone who was raised in the Russian tradition, I want to say that we have grown accustomed to a different way of marking Holy Saturday. The divine services are quiet and peaceful. On this day we do not even dare commemorate anyone at the Great Entrance. We reverently go out with the Chalice and then go back into the altar in silence: “Let all mortal flesh fall silent.” With us, everyone approaches the Burial Shroud very quietly, weeping and praying. But at night there will be a beautiful, joyful, and triumphant “Christ is Risen!” But here there is a lot of disappointment. Our people cannot understand the Eastern mentality: the shouting, whistling, jostling, and running around. 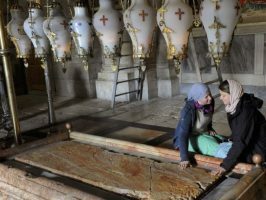 I have heard no few words of disappointment from those who have been to the Holy Sepulcher on Holy Saturday. And we should not judge the police and special units. They are only doing their job, making sure that people do not crush one other or engage in any kind of ethnic or inter-confessional conflicts. None of this corresponds to my understanding of Holy Saturday. If someone needs to travel to the other end of the earth in order not to pray, and just to endure something – then this is just what they want. 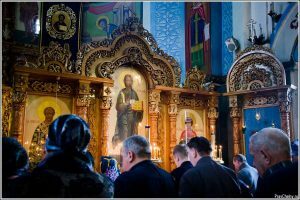 If someone needs to make a comparison so that they can rejoice that at home in Russia it is quiet and prayerful, or if someone needs it for confirmation of their faith, then let them come. Everyone needs what they need. There is only one thing that I must insist upon: the question of the Holy Fire must not be dogmatized. If this had been necessary it would have been written in the acts of the Seven Ecumenical Councils. But this question was never examined there. That means that the descent of the Holy Fire is not a Mystery of the Church. After all, we recognize seven Mysteries. Can we call it a liturgical rite or a tradition? Translated from Greek, it is called “The Rite of the Holy Light.” We have a rite for blessing rings, a rite for blessing wells, the rite of the Panagia. This is a rite printed on paper. On our website we are going to publish the prayer that the Patriarch reads in the Kuvouklion. This text will immediately clarify everything. There is not a single word about the end of the world, nor a single word about whether the flame is lit or not. It speaks of God as Light, stating: “we are performing a manifestation of light,” in other words, the rite of the Holy Light. It could not be said more precisely. So we only need to pray and refrain from posing improper questions. We need to cultivate in ourselves a spiritual understanding of every question, including this one.